The digital inkjet ink on paper printing is broadly used in the market and even increases more within recent decade; meanwhile, one of the most important transitions is from screen printing to plateless printing. Lately, the textile industry has applied the technology to textile fabrics, expecting the execution on proof and on the market of small quantity orders. The innovation of the process will save the time, labor, money and reduce the pollution; most importantly, to respond to customers with efficiency. With the advancement of technology, CHROMOINK keeps working on the latest progress of dyestuff and the ink for textile printing conforming to the requirement of environmental protection. Application: Digital printing on polyester fibers and other PES textile products. Sun durable, weather-proof, water-proof, environmental friendly; a popular product in the market. (A) Direct Printing (IDD)：Print directly on the polyester fibers and then heat up the photo. (B) Sublimation Transfer Printing (ITD): Print the image on transfer paper and then use heat to transfer dye to a medium – the printing dye is heated up until it turns into a gas, at which point it diffuses onto the printing media and solidifies. 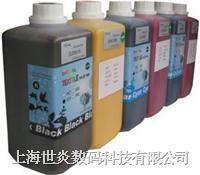 The ink application is not only on polyester fibers but also on porcelain and metals.